People on Wednesday offer funeral prayer of Sabika Sheikh, Pakistani exchange student killed in a mass shooting at a high school in Texas, in Karachi, Pakistan. Her body has arrived in the port city of Karachi, where her family lived and where she is being buried. 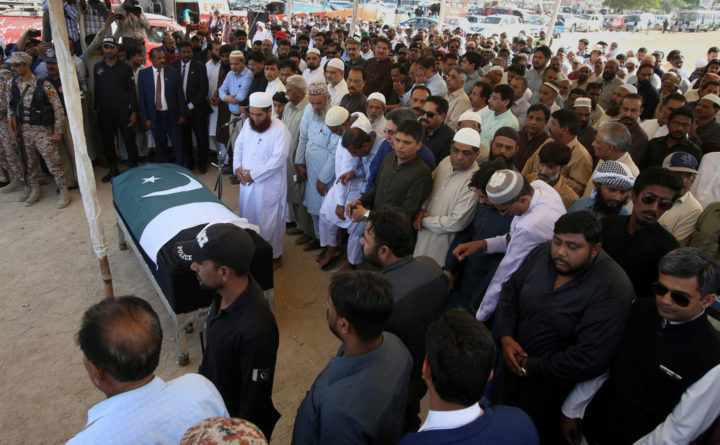 KARACHI, Pakistan — Thousands of people in Karachi attended the funeral Wednesday for a 17-year-old Pakistani exchange student who was killed in a mass shooting at a Texas high school. Sabika Sheikh was among 10 students and staff slain Friday at Santa Fe High School near Houston. She was her family’s oldest child and began classes at the high school last August. She had been planning to return to Pakistan in a few weeks for Eid al-Fitr, the three-day holiday marking the end of the Muslim holy month of Ramadan. Her tearful father, Abdul Aziz Sheikh, went to the Karachi airport to receive her body early Wednesday as it arrived in her hometown. Among the many mourners at a city mosque was the provincial governor. “Before her death, she was just my daughter, but now she is the daughter of Pakistan, and it is only because of the love of people, who mourned her killing,” her father said. After the coffin was lowered into the ground, he said her life and the lives of others would not be wasted if steps were taken for stricter gun control in the whole world. Sabika Sheikh said she had hoped to one day join Pakistan’s foreign service and become a diplomat. Police have said the 17-year-old suspect in the shooting used his father’s shotgun and .38-caliber handgun. The shooting reignited the debate over gun control in the United States. Pakistan requires gun owners to be licensed, but the rules are poorly enforced, particularly in the tribal regions along the border with Afghanistan. Heavily armed militant groups have carried out scores of attacks in recent years, including at schools.